I love my Astra Militarum army 'The Emperor's Feth and it is designed to function with maneuverability and firepower in equal measure. However it is really easy to get bogged down and trapped if the enemy can make it in close. There are ways that I combat this but I don't have an attacking counter punch that can really hit back. I love the old Ogryn models and have a few of them but in my view Ogryns just don't cut it and I've rarely used them in a game. However, I have admired the Bullgryn models for a while as they look fantastic - great sculpts and very fitting in the way they look. I also have a few transport options that could easily transport them into the places they are needed. - Are they any good? - Are they worth paying £22.42 (Element games) for only 3 models? - Are they worth the points cost? - How do they work in a game situation? It is possible to switch out the 2 wargear options to a power maul (melee only) and a brute shield (having a 4+ inv. instead of adding 2 to any save rolls). I have to say that for an extra 7 points it looks like the Bullgryn Maul is a better choice than the grenadier gauntlet. It limits you to melee only but the shooting stats for a gauntlet are random and aren't really going to do much damage - especially as you have to be within 12" to use it in the first place. 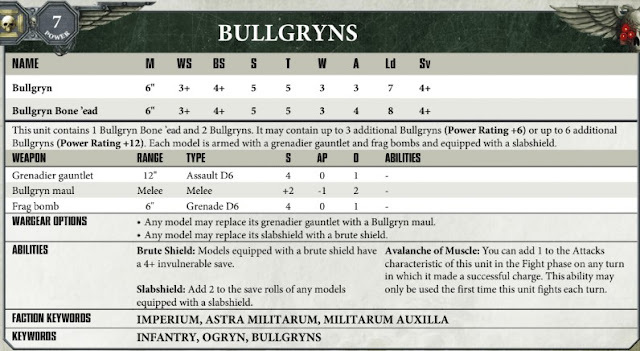 The maul gives extra strength, AP and Damage which means the Bullgryns can realistically threaten multi-wound models and anything with decent armour. As for the shield choices without playing a few games it's hard to say whether a 2+ save from the slab shield or a 4++ invulnerable save from the brute shield would be better. They both cost the same but without knowing your opponents in advance, at a pinch I would always go invulnerable as you are always passing half of your saves regardless of who you face! On the charge they get an extra attack from their special rule and so a base unit of 3 Bullgryns would have 13 attacks on the charge at S7, AP-1, D2 (with a maul). This is a pretty hard punch that will waste a unit of terminators no problem or hurt a vehicle pretty badly. To me this all sounds pretty positive I have to say. Maybe not as an attacking force - there are only 3 models after all - but as a counter attack the opponent would have to be wary of them for sure. Are they worth the points cost? Bullgryns seem pretty expensive points wise I have to say. A squad of 3 with power mauls and brute shields is getting on for the price of a decent tank so the question is always one of their role in the army in combination with the other units you have. - push them forward as a speartip and support them with long range firepower. I feel that 2 or 3 units are probably more useful than 1 but again - would I rather have 2 or 3 tanks? I think overall they are fairly priced but the play-style of the army dictates whether they are worth it or not. How do they work in a game situation? As I've said above these guys can be used in so many different ways depending on the units already in the army and the play-style of the general. 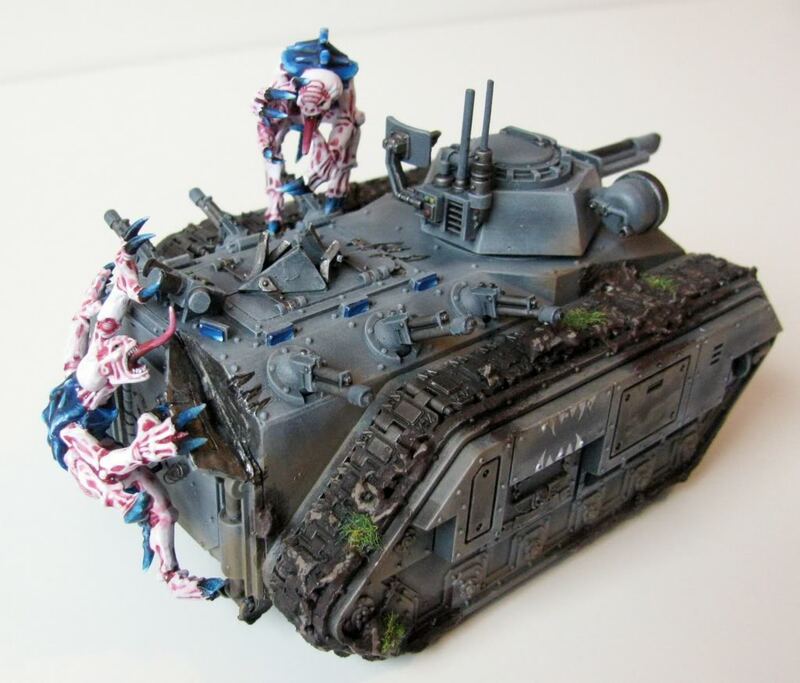 I do think that they could fit my play-style of mobility and counter attack if I put two units in chimeras. Priest - adds an extra attack per Bullgryn - in a squad of 3 not worth it in my opinion. Yarrick - Very fluffy and a couple of bonuses such as re-rolls 1's to hit but too much of an investment to hang around with just 3 Ogryns I feel. Psychic powers - Psychic Barrier and Nightshroud are the main psychic powers which -1 to hit if someone shoots at the Bullgryns or adds +1 to their save. Both are worth it for extra durability. Medi-Pack - Keep a command squad with a medi-pack within 3" and the Bullgryns can regain a wound lost on a 4+ - Great but now you have to manage a command squad for a 50-50 chance of a wound back. The other question we need to ask is transport - how do we get them into the fight? 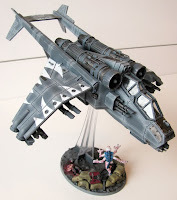 I think that there are two main options - Chimera and Vendetta (I own both of these units). Chimera - Tough and fairly mobile these tanks should be able to drive across the battlefield, park up, survive and then the Bullgryns will have a 3" disembark and a charge to get into combat. The only problem being that Chimeras are a little expensive - but they are cool too! Vendetta - I love Vendettas!!! 3 x twin-linked lascannons - what is not to like!? Seriously though you can achieve a first turn charge with these bad boys - fly, use grav chute insertion to disembark (9" away from the enemy), move 6" and charge 3"!!! In my mind the Astra Militarum should be cheap and plentiful and so I do struggle with adding more points to a unit for a small buff. 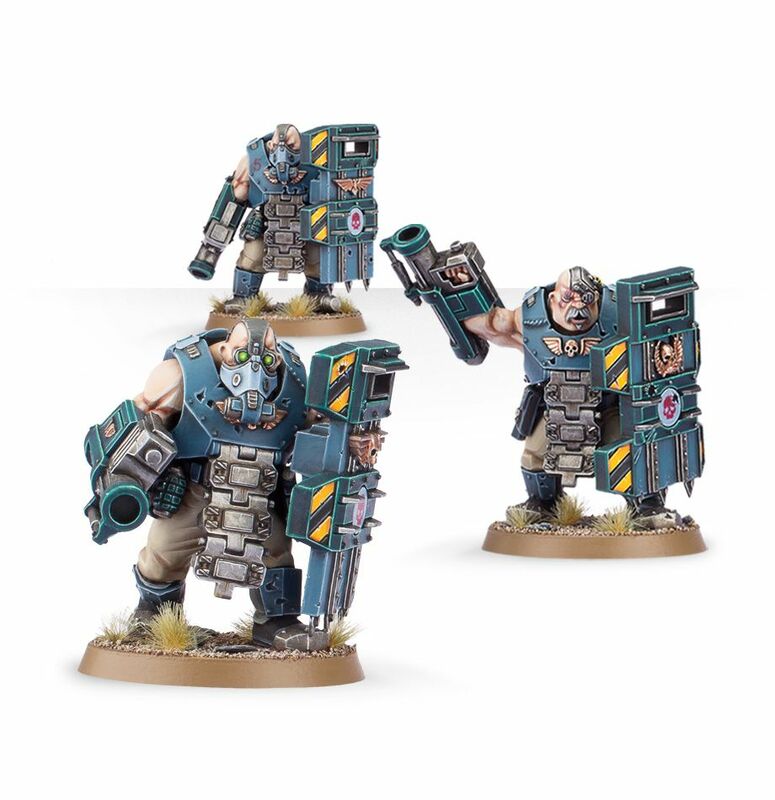 Bullgryns are certainly never going to be a death star and so 2-3 units cheap and cheerful is the way to go for me. I will buff them with psychic powers if anything as I already have psykers in my army. Giving them transports - really depends on the army being played and what you have in the rest of your army to back them up. 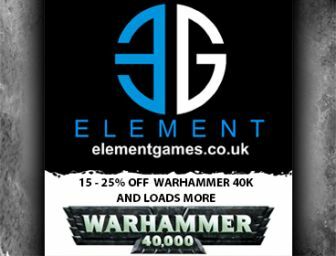 Are they worth paying £22.42 (Element games) for only 3 models? Effectively £7.50 per model is pretty expensive, even for a larger model. I quite fancy 2-3 units but £75 scares me quite somewhat. The models do look amazing and are beautifully themed to fit into the Astra Militarum army but unlike other kits they are not massively customisable and don't have loads of weapon options. Personally I think that they are overpriced, I think that £18 should be the top end for these models - of course I'll still get at least one unit!!! Sorry if I have rambled a bit on this topic, I kind of just put my thoughts down as they came out rather than structuring things properly! If anyone has used Bullgryns before let me know what you think and how they fit in your army. What is their role and what is your playstyle like? I haven't used them myself, but I've played against them, and read a number of BatReps featuring them. Most people I see getting good use from them are using Slab Shields and Power Mauls. The Brute Shield used to be the go-to choice, but after it was FAQed to not stack with things like Psychic Barrier or Take Cover, the Slab Shield came back to the fore. If they're in Cover, or have Psychic Barrier up, the Slab Shield is as good as or better than the Brute Shield against anything up to and including Lascannon fire. Even without Cover or any other bonus, it's better against all small arms fire, and most of the high rate-of-fire, moderate Strength weapons that a Unit like this tends to draw attention from. For small Units, dropping them out of a Valkyrie or Vendetta is obscenely good. I'm honestly not entirely sure that's the intention of the Rule, even tho they've had like four chances to change it so far, and haven't. If you go into Hover Jet mode and only move 19" or so, you don't even have to roll to see if they splat. They're not as good a deathstar as they were before the nerfs, but a full Unit of 9 with Psyker and Priest (and possibly more) support can still soak a ludicrous amount of firepower, and dish out plenty of damage back. Thanks for the comment WestRider - one of the few positive ones! Even if they aren't a strong deathstar I quite like the idea of using them as a counter or even just throwing them upfield as a distraction for the opponent while the rest of the army rains down the Emperor's vengeance! Cool models too!